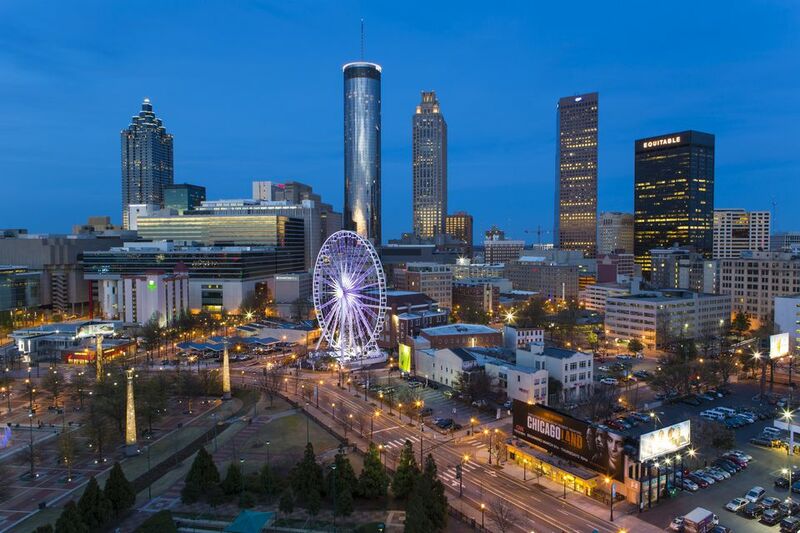 The area is also home to the headquarters of many of Atlanta's biggest businesses and a slew of large, reasonably priced hotels—making it a top destination for business travelers in Atlanta. Atlanta's downtown neighborhood is a bit confusing to drive through, with many one-way streets and strange intersections, but it is also one of the most accessible areas in the city. It is a transportation hub, with several Marta stations and easy highway access from both the 75/85 Connector and I-20. It is only about 20 minutes from the airport and cabs are usually available in the area. Much of downtown is walkable and is safe during the day. Because the area is most active during business hours, late night walking is not recommended if you are going more than a few blocks. During major events at The Georgia Dome and Philips Arena, you will find heavy law enforcement in the area around the sporting and concert arenas, making walking more feasible. There is a large amount of parking available downtown. The Georgia Dome, World Congress Center, Philips Arena, and Pemberton Place (the Georgia Aquarium and World of Coke) all have dedicated parking facilities. In many cases, you can purchase a parking pass when you buy your advance ticket to an event. However, there are also dozens of surface lots within the area that are a safe walking distance from the attractions. While some lots do accept credit cards, you should always be prepared with cash just in case. Expect to pay anywhere from $5 to $25 depending on the popularity of the event and how many other events are happening in the area. For most major events at the arenas, parking in surface lots is around $20. Use caution when you are parking in surface lots downtown—sometimes you will encounter scam artists who will try to act as parking attendants. They may even have official-looking parking vouchers. In most cases, these people will look professional enough but will not be in a uniform. Look around for signs and be sure to only pay a uniformed attendant that matches the company owning the lot. Also be on the lookout for signs warning "No Attendant on Duty," in which case there will usually be an automated payment machine. These scam artists will pressure you and make you feel unsure until you pay them. If you are worried about this, look into pre-paid parking through your event facility so that you know you are not at risk. With so many major attractions in the area, you can bet you'll find dozens of restaurants within easy walking distance. Unfortunately, downtown is not the hotbed of fine cuisine in Atlanta—but don't worry, you'll still find plenty of options.